Artificial intelligence has already sped its way into almost every sphere of the modern lifestyle – from hospitality to healthcare – hence; unsurprisingly the A.I. technology has begun to make some serious moves into the world of the latest tech most. 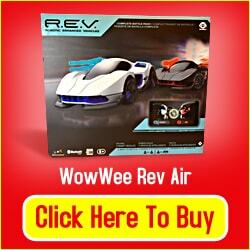 Who Should you buy The WowWee Rev Air for? 1. The impressive toy car has enough punch and potential that can definitely elevate your gaming experience with A.I technology. WowWee REV Air brings a completely new flying dimension to your battlefield. This model combines all the latest technologies of advanced battle-games to present you a sheer real-time gaming experience. Whether you are a game lover or not, you will be surely impressed with REV Air’s striking features and advanced tech.